Republicans made a clean sweep of the Solvay village election on March 17. Unlike the previous election, Democrats provide some opposition. John Dooghan is elected trustee in the first ward, defeating his Democratic opponent, William O’Brien, 657 to 468. Louis Valletta wins in the second ward, beating Stanley Major, 492 to 309, and in the third ward Walter O. Scheiss defeats Edward Harvey, 470 to 349. Quick work by the Solvay Fire Department was credited with saving the home of the Rev. William H. Mersfelder on Grand Avenue, Town of Geddes, on September 8. Fire caused by a defective electrical circuit broke out this morning in the house that was unoccupied because the Rev. Mersfelder is in Binghamton. Solvay fire fighters, led by First Assistant Chief Frank Willoughby and Second Assistant Chief George Kohler, arrived a few minutes after the fire was reported about 8:30 a.m. The fire was quickly extinguished, but not before damage estimated at more than $2,000 had been done. It was reported today that Fritz Friedli, 29, son of Mr. and Mrs. John Friedli, Solvay, was critically burned Boston’s Cocoanut Grove nightclub fire that took the lives of 492 people on three days earlier. It was the second-worst single-building fire in American history, topped only by the Iroquois Theater fire in Chicago, which killed 602 people in 1903. The Cocoanut Grove fire was inadvertently started by a 16-year-old busboy who lit a match in order to find an empty light socket. The match touched off a canopy of artificial palm fronds and quickly spread and within five minutes engulfed the entire nightclub. Friedli was attending the Officers Candidate School and Harvard. His wife and child live in Oregon. Sergeant Timothy Marotta of Syracuse and his wife, Alice, were killed in the fire, which perhaps was the biggest disaster of the year on American soil. Rico Woyciesjes, three times intercollegiate light heavyweight boxing champion during his ring career at Syracuse University, leaves tonight for Parris Island to begin training with the United States Marine Corps. Bidding farewell to his friends in the neighborhood of his home at Gere’s Lock, Solvay, the husky Halcomb Steel Company worker, who won the championships in the ring in 1939, 1940 and 1941, as well as reaching the national finals in 1937 in the 175-pound division, plans to join friends at the U. S. Marine training station. They are Joseph Chesneski of Second Street, Solvay, a Solvay football players, and Sammy Plants, 142 Worth Avenue, Solvay, also a village high school grid man. Rico has a brother in the service, too. He is Michael Woyciesjes, 20, who is in training at Maxwell Field, Alabama, in the U. S. Army Air Corps. Pvt. John P. Alfonsetti doesn’t think being a soldier is enough to do for his country, so he is going to buy a $25 Defense Bond every two months and send it to his mother. His parents, Mr. and Mrs. Anthony Alfonsetti of 1225 Milton Avenue, Solvay, have received a letter from their son, now stationed at Schofield Barracks, Hawaii. He sent his mother a bond for her birthday and the information he would send another every two months. Mrs. Alfonsetti went to the Onondaga County Savings Bank yesterday, taking Mrs. Laura Valerio of 2059 Milton Avenue, who bought $275 worth of Defense Bonds. Mrs. Valerio has a son who will enlist soon. Two brothers, separated since October, met here recently. Pvt. Benancio Manuel Fernandez, a member of the Air Corps unassigned, came from his base at Fort Wayne, Ind., while Frank Fernandez, employed by a public accounting and auditing concern in New York City, came here from Mexico City. Their home address is 400 First Street, Solvay. Frank Fernandez, a graduate of Syracuse University, is now seeking an ensign’s commission in the Navy. Frank Baldrini, 51, of 224 Woods Road, Solvay, veteran New York Central Railroad conductor, was inducted into the Army today after enlisting at the Syracuse Recruiting Office in the post office. His enlistment makes the third “hitch” in the service for Beldrini, who served overseas in the first World War and re-enlisted after the war was over. Baldrini, father of four children, has been employed as a conductor on the New York Central 22 years. He is president of the Solvay Tyrol Club. Rocco Pirro, Solvay athlete who shone in college football for Catholic University and who has been in the National Football League the last two years, is a chief petty officer in physical education in the Navy now and hopes to be able to qualify for admission to Officers Training eventually. His younger brother, John, is a midshipman at Annapolis and his brother, Carmen, who has been coaching at Catholic University of late, is home awaiting orders as to when he shall report for a try at Naval aviation. Pirro is stationed at Newport, where there is no football team, and nothing would suit him as well as a transfer to South Carolina, Georgia or Iowa, which would give him a chance to play with one of the preflight naval training elevens. Two brothers representing different arms of the service had their first reunion in six months during the Christmas holidays when both came home on furlough. They are Edward J. Lundy Jr., seaman second class, and Staff Sgt. Wallace J. Lundy, sons of Mr. and Mrs. Edward J. Lundy of 306 Cherry Road, Westvale. Their uncle is also in the service. He is James R. Lundy, who was graduated recently from a radio school and is now stationed as a private at Hammer Field, California. Seaman Lundy enlisted four months ago. He is 20 a graduate of Solvay High School in 1941 and now in the Navy electrical school at Newport, Rhode Island. He was on the hockey team of Solvay High School. His arrival home was a surprise to his parents who had had no work that he was coming. Prior to his enlistment he was employed in the electrical department of Halcomb Steel Company. Sergeant Lundy, 24, also was graduated from Solvay High School and was employed by Halcomb Steel. He has been in the Army about nine months and is in the Signal Corps stationed in Missouri. He was promoted to his present rank two months ago. James Lundy has lived in Syracuse all his life and before enlistment was with the Easy Washing Maching Corporation. Flash Demerski — if dogs have last names — went to war last night. By express. Uncle Sam wants him, and that’s an honor for any dog. Flash is a big, intelligent German Shepherd, the pet and friend and watchman for Mr. and Mrs. Paul F. Demerski of 205 Windemere Road, Solvay. He’s a year and a half old and insists on toast and milk for breakfast (and the toast must be warm). Whether he’ll get that morning ration when he joins the Army isn’t known, but his morale will be much better if he does. Flash has been with Mr. and Mrs. Demerski since he was a playful puppy. Mr. and Mrs. Demerski didn’t really want to give up Flash, and Mrs. Demerski says they’ll miss him. “But we though if he would be such a good helpful friend and watchdobg to some soldier as he’s been to us, we ought to give him up,” said Mrs. Demerski. Flash wagged his tale in corroboration. And when Flash wags his tail, one should be out of the way of it. Mr. and Mrs. Demerski went to the train last night so Flash wouldn’t have to be in the crate too long. They said goodbye to him there. Flash likes the children in his neighborhood, but he barks at strangers until they’re properly introduced or accredited by his folks. He likes to catch a baseball and retrieve it. He usually slept on the cellar stairs, but when it was warm he had the run of the house. Of late he slept in an easy chair in the living room. Mr. and Mrs. Demerski wrote in June to the adjutant general at Washington, offering Flash for service. He referred them to Dogs for Defense, Inc., in New York, which sent a questionnaire and asked for a picture. Flash made a good impression, so now he’s off to help the soldiers do sentry duty. He goes to Hicksville, Long Island. War would affect every aspect of our lives until late 1945 ... and haunt us ever after. What's amazing about the World War 2 years is how normal life in the United States may seem to those who make a superficial study of this period. Frightened at first, Americans at home soon began to feel safe. 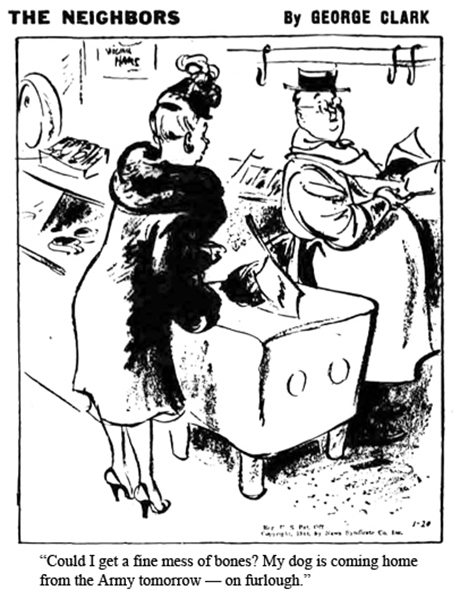 Rationing aside, Americans enjoyed most of the things they always did. Hollywood continued to entertain us, and so did professional sports, though the level of competition may have dropped at bit. But millions of our young adults were in uniform; many would be killed or wounded. Solvay's servicemen and servicewomen are mostly featured on separate pages devoted to the parts they played in the war. Two big German cannon in Syracuse and one in Solvay, each a trophy of the first World War, may find their way to the scrap metal heap and, in so doing, help to win the present war. One of the souvenir guns stands in front of the American Legion Club House in West Onondaga Street. Another is opposite the Sacred Heart School at West Genesee Street and Park Avenue. A third is in Woods Road, Solvay. These guns are among many scores brought to this country after the other war and allotted to different states to be placed in public places as momentoes of the conflict. Many of them have been offered to the War Department by the communities which now own them under the impression that they could be used as weapons. They cannot be so used, however, and their only value is as scrap metal. It is suggested that they be sold to junk dealers and the proceeds be invested in Defense Bonds or used in some other way to help Uncle Sam. “The interest shown by these civic groups in our armament program is greatly appreciated by the Ordnance Department. It must be pointed out, however, that these cannon and machine guns now have value only as scrap. It is suggested that civic groups wishing to make thse items available for present needs make contact with their local scrap metal dealers and offer the items for sale. “The money derived from the sales might be used to purchase Defense Bonds or stamps, or as a contribution to the American Red Cross, or for the purchase of locally needed defense equipment. 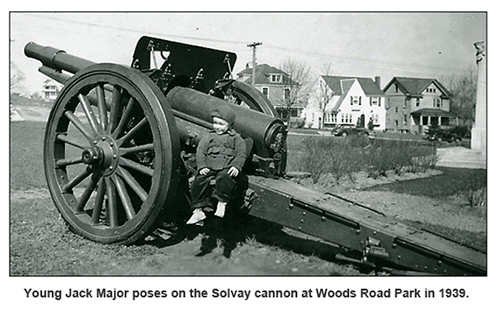 Patriotic fervor gave way to common sense — the Solvay cannon remained in place on Woods Road. The Allies would win the war without the scrap metal the cannon could have provided. However, the harsh reality of war was setting in, conveyed in stories about about the deaths of young men who only a few months earlier had been neighbors to many Solvay residents ... young men such as Dalton R. Hardy, Fred W. Herring Jr. and Anthony Dannibale. Others, such as David I. Sidnam, survived to tell what it was like to be under fire. Hardly a day passed when local newspapers did not mention a local man or woman who had traded in civilian clothes for a military uniform. Many items I found on such men and women with a Solvay connection begin on Solvay Goes to War. Accepting the offering was Gene Pirong of 201 Draper Avenues, Solvay, who is in charge of the station. George H. Aaf of 2703 Milton Avenue, Solvay, who is general foreman of the porcelain department at Pass & Seymour, parted with a collection he started 29 years ago — an armful of old license plates, starting with one from his first car, a Ford touring automobile he purchased in 1913. He also purchased the start of a new collection — his 1942 license plate. 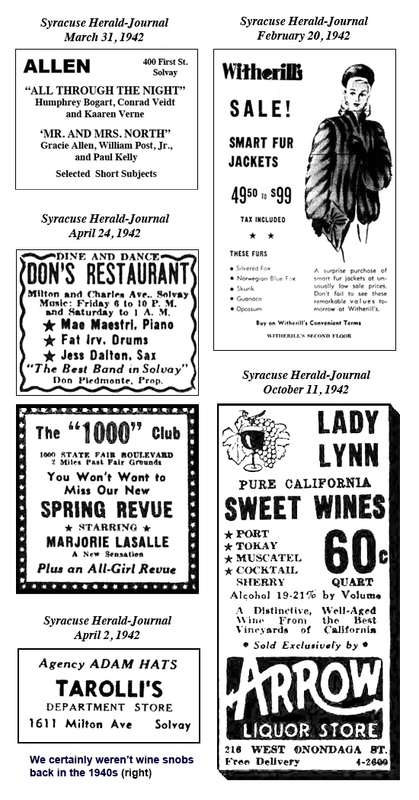 It was announced on March 24 that the 1942 New York State Fair at Syracuse has been canceled because the fairgrounds have been turned over to the United States Army for military encampment. The fair had been scheduled to be held from August 30 through September 7. This is the first time in 102 years that the fair has been called off. Solvay police aided the FBI, the New York State police and Syracuse police in raids on April 23 that led to the arrests of three enemy aliens who were charged with violation of the Presidential proclamation calling for the reporting of all arms, ammunition, cameras and radios. The raids netted five cameras, several shotguns and rifles, two shortwave radio sets and several hundred rounds of ammunition. One arrest was made in Solvay, one in Syracuse and one in Fulton. Those arrested were two Italians and one German. They were taken to a Federal detention facility. The civilian protection system of the town of Geddes met June 15 in the Solvay Public Library to arrange a public demonstration of civilian defense scheduled for Saturday, July 25, at Woods Road Park. About 600 residents of the town are enlisted in civilian protection duties. The demonstration will be preceded by a parade featuring drum corps and bands and organizations — such as the Boy Scouts and Sea Scouts — who are part of the protection system. Adrian J. Grobsmith, state vice commander of the Veterans of Foreign Wars, was sworn in January 18 as the Town of Geddes justice of the peace, filling a vacancy created by the death of John D. Kelly in December, 1941. Grobsmith, who operated a trucking business, also had been a Solvay village trustee for six years. He resigned that position to become justice of the peace. Succeeding him as first ward trustee was John T. Dooghan. Both men lived on Charles Avenue. On February 26 Solvay High students were among those honored with prizes at the 15th annual national high school art exhibit at E. W. Edwards & Son department store in cooperation with Scholastic Magazine. One of the stars of the exhibition was Solvay’s William Brandy awarded first place honors in black ink, advertising art; second place honors for watercolor, charcoal, black ink and oils, and an honorable mention for watercolor. Other first place winners from Solvay: R. Heim (advertising art), Edward Musengo (advertising art), William Del Favero (ink, spatter ink), George DiGilio (ink), James McGraw (dress fabric design) and Lucille Porter (sculpture). Second place: Elizabeth Casler (dress fabric design). Honorable mention: Martha Jablonski (design on fabric) and Doris Duprey (pastel). John Sherry was named valedictorian of the June graduating class at Solvay high School. He has been awarded a scholarship to Yale University. Miss Elaine Petosa, secretary of the senior class, was named salutatorian. She has received a scholarship to Central City Business Institute. Mario Rabozzi, 13, of 201 Case Avenue, Solvay, never drove a car in his life, but he is a Boy Scout, and when something has to be done, Mario does it. Besides, he had watched his father drive and knew just how to shift gears and brake, and that came in handy Friday night. Mario saw a car, without passenger or driver, which had slipped its brakes and was running away down grade in Darrow Avenue, Solvay. Neighbors say Mario jumped into the car, slowed it and turned it into a driveway on the street and put on the brakes and left it, probably thus preventing considerable damage, if not injury. Mario is a son of John Rabozzi and is a member of Troop 72, Boy Scouts. Frank W. Conway of 110 Alice Avenue, Solvay, was selected by the town board of Geddes on December 30 to become supervisor, filling the vacancy created by the election of Charles Tindall to sheriff. Mr. Tindall would his new duties on January 1, 1943. Mr. Conway has served for seven years as clerk of the town of Geddes. His successor in this post, also chosen by the board last night, is John T. Dooghan of 235 Charles Avenue, Solvay. As supervisor from the town of Geddes, Mr. Conway also will serve as chairman of the town board. He is a Republican, a native and lifelong resident of Solvay and widely known in the village’s athletic circles, having been a three-letter man while attending Solvay High School. News of the death of Anthony Dannibale, 21, in action in the South Pacific has been received from the United States Marine Corps by his father, Joseph Dannibale of 103 Cogswell Avenue, Solvay. A former Solvay High School student, Dannibale attended St. Cecilia’s Church, Solvay, and was a member of the Syracuse Boys’ Club. Prior to enlistment he was employed by Pass & Seymour and by the Halcomb plant of the Crucible Steel Companyof America. Surviving are his father; three brothers, Louis, Mariano and Phillip, all of Solvay, and three sisters, Mrs. Frank Spenzerio of Albany and the Misses Josephine and Mary Dannibale of Solvay. Miss Helen F. DeLamater, head of the English Department at Solvay High School, died February 8in Syracuse Memorial Hospital after a short illness. A native of Cato, Miss DeLamater was graduated from Solvay High School and from Syracuse University in 1911. She taught one year at Richmondville before going to Solvay in 1912. Survivors: her mother, Mrs. Eva DeLamater of Solvay, and two uncles, John H. Carter of Jordan and Alvin K. Carter of Syracuse. James Farrell, 72, 109 Lamont Avenue, died January 28 at University Hospital of injuries suffered in an automobile accident that occurred on November 6, 1941. Farrell, a reitred grover, was a passenger in the car driven by Justice John D. Kelly of 205 Orchard Road, who died December 1 from injuries in the accident two miles north of Skaneateles. Farrell was a widely known Solvay resident and father of Charles Farrell, village treasurer who died in 1941. He had operated a grovery story for more than 25 years before retiring about eight years earlier. He is survived by three sisters, Mrs. Wiliam Welsh of Syracuse, Mrs. Catherine Callahan of Herkimer and Miss Nellie Farrell of Syracuse; three brothers, Lawrence of Newport, Thomas of Oneida and John Farrell of Utica, and two grandchildren, James R. and Ann T. Farrell. Lieut. Dalton R. Hardy, 23, son of Mr. and Mrs. John C. Hardy of 406 Center Street, Solvay, was one of two victims of a fatal air cash late yesterday at Cochrane Field, Mason, Georgia, according to word received from the Army Field Public Relations Office. The other victim was Kenneth N. Thomson, 27, of Edinburgh, Scotland, Royal Air Force cadet, who trained previously at Americus, Georgia. A Syracuse University graduate and an instructor in the Army Air Corps, Hardy was killed in a training ship that was returning from a routine flight. He was one of 11 cadets who enlisted in Syracuse last February 10. He was awarded his wings at Maxwell Field last November and, following a brief furlough in Solvay, was assigned to Cochrane Field as a primary training instructor. He had received a telegram yesterday from a close friend, Wendell Morris, son of Mr. and Mrs. Wendell C. Morris of 326 Hall Avenue, Solvay, arranging for a meeting at Maxwell Field, where Morris is to start training as an air cadet following his enrollment this week. Hardy was a graduate of Solvay High School and a member of the class of 1939 at Syracuse University, where he received a bachelor of science degree in business administration and journalism. He was a member of Beta Theta Pi fraternity. Surviving members of the family include his parents, who last night received a telegram from the War Department notifying them of their son’s death, and a brother, Sgt. Edwin C. Hardy, stationed with the ROTC at Syracuse University. The crash of an Army bomber on a routine training flight yesterday cost the life of Staff Sergt. Fred W. Herring Jr., son of Mr. and Mrs. Herring of Camillus, the Associated Press reports. The accident occurred near Post Falls, idaho. All five of the crew were killed. The report from Geiger Field, near Spokane, Washington, gives the other casualties as follows: Lieut. William P. Marsh Jr., no address listed; Second Lieut. James H. Briggs, Gary, Indiana; Sergt. Robert H. O’Brien, Buffalo, and Pvt. Raymond J. Luettgen, Milwaukee, Wisconsin. Herring was graduated from Solvay High School in 1937 and attended a Syracuse business school before entering the employment of Dun & Bradstreet, with whom he served three years. He enlisted in the Air Corps in September, 1940, and served at a number of field in various parts of the country before he was sent to Spokane. He was a specialist in aviation motors. Eugene (Skippy) Hayes, 15, of 302 Hall Avenues, Solvay, was killed October 12 in a shooting accident on the farm of Assisstant District Attorney Arthur Wilson in Marcellus. Coroner H. Ernest Gak ruled the boy’s death was accidental. Hayes and a friend, Herbert Bell, 16, of Marcellus, were hunting crows in a ravine on the Wilson farm. Hayes, a junior at Solvay High School and a member of the cheerleading squad, was crouched several feet ahead of Bell when they spotted a crow in the bushes. Hayes stood up just as his friend fired his double-barrelled shotgun. The charge struck him in the back of the head. Hayes was the son of Mr. and Mrs. Douglas Hayes and lived in Warners until 1941 when his mother moved to Solvay. His father left the family in 1939 and moved to Canada. Mrs. Hayes said she hadn’t heard from her husband since he left. Besides his parents, the boy was survived by two brothers, Ronald and Carl. J. Irvine Lyle, 68, president and founder of the Carrier Corporation, died June 7. Lyle and his wife, the former Elizabeth Biggerstaff Lyle, lived on Orchard Road in Solvay. Mr. Lyle collaborated with Dr. William H. Carrier in 1902 in developing a scientific air-conditioning system which has been credited with launching this new industry. Later both men formed the Carrier Engineering Corporation, reputed to be the first company to devote itself exclusively to air conditioning. Born in Fayette County, Kentucky, Lyle began his career in 1896 with the Pulman Company and later was associated with the Southern Railway Company and the Buffalo Forge Company. Besides his wife, Lyle was survived by a daughter, Cornelia Elizabeth Lyle Snyder of Skaneateles, and a son, Joel Irvine Lyle III of Orlando, Florida. James J. McNeill, 68, 220 Draper Avenue, Solvay, a retail salesman for the Watkins Quality Products Company, died January 18 shortly after collapsing in his pew in St. Charles Church during 8 o’clock mass. Born in the Town of Onondaga, Mr. McNeill was a son of Patrick and Margaret McNeill. He was a salesman for the Watkins Company about 20 years. Survivors: His wife, Mrs. Alice Murphy McNeill; a son, Joseph P. McNeill of Syracuse; three daughters, Mrs. Michael P. Hayes, Misses Mary A. and Alice G. McNeill; three sisters, Mrs. John Graham of Nedrow, Mrs. John McClarity and Mrs. Thomas O’Neill of Syracuse, and two grandsons, M. Francis Hayes and Joseph P. McNeill Jr.
Solvay won the New York State Section III basketball championship, though it was only a one-game tournament and not at all like the championship Solvay would win the following season. A week later, perhaps seething from its loss to Camillus, Solvay took it out on Marcellus High, 52-8. Joe Szczech paced Solvay with 15 points. Solvay rolled the rest of the way, beating Baldwinsville, 47-31; Jordan High, 49-12; Split Rock High, 41-14, and then putting the Camillus jinx to rest, at least for awhile, 65-30, as center John Szczech, brother of Joe, scored 26 points, an uncommonly high total for the times. Marcellus, seeking revenge for their humiliating defeat six weeks earlier, led Solvay, 21-19, at halftime of their rematch. After intermission, however, Solvay outscored Marcellus, 41-13, and chalked up another easy win, 60-34. Jimmy Rowe scored 22 points for Solvay, Henry Zamojski added 19. On March 17 Solvay won the championship of the western division, beating Baldwinsville, 46-38. Four players scored all of Solvay's points — John Szczech 17, Joe Szczech 12, Jimmy Rowe 11 and Bob Himpler 6. All of Himpler's points came in the last two minutes and provided a cushion in what had been a nip-and-tuck game. Three nights later Solvay edged the eastern division champ, North Syracuse, 41-40. The game was won at the foul line, as each team scored 15 baskets, but Solvay was successful on 11 free throws in 16 attempts, while North Syracuse converted only 10 of 24. In the preliminary game Baldwinsville won the county junior varsity championship, beating East Syracuse 24-15. Solvay finished its season with that Section Three championship contest against Mexico High. The Bearcats were heavily favored and proved why, winning easily, 65-26. Scoring 60 points or more in those days was rare. As good as the 1941-42 season was, an even better basketball season awaited. Solvay High School took first place in the Section 3 and 4 high school bowling tournament in Fulton. Billy Hurst of Solvay had the high three-game total of 591. The Solvay team score of 2,741 was the second highest ever recorded in the tournament. Other members of the team were Bill Del Favero, Angelo Aurelli, Dan Capucilli and Jack Mosher. I found little on the Solvay High hockey team, only stories of two victories over Baldwinsville and a tie with Skaneateles. Last names of Solvay plyers mentioned in the stories were Renders, Kulak, Raus, Zamojski, McAuliffe and Demerski. Likewise, little was found on the 1942 Solvay High baseball team, which apparently had a so-so season, finishing behind champion Baldwinsville and runners up Camillus and Skaneateles. Oddly, the only Solvay game I've found so far had the Bearcats beating Baldwinsville, 9-5, on May 18. Solvay High's football team won the County League championship. Earl Hadley was the coach, team members included Fred Amellia, Charles Atwood, Charles Barnes, Dan Canestraro, Joseph Cilani, Samuel Collelli, Robert Demerski, James Farrell, Richard Forger, Donald Glisson, Robert Hempler, Robert Kulak, Ronald McCadden, Jim O'Leary, Richard Onderkirk, Richard Orr, Richard Osada, Gerald Raussa, Glen Robinson, Richard Salvagni, Anthony Santaferra, Francis Sharkey, Joseph Szczech, Richard Tarolli, Edward Webster, and Henry Zamojski. Henry Ponti was the team manager), Vincent Lopez and Richard Ryan the assistant managers. Hopes were high when Solvay High opened its 1942-43 basketball season, but probably few imagined just how successful it would be. Solvay teams often scrimmaged City League teams, but this year they actually scheduled them for two games that counted. Solvay won them both, beating Onondaga Valley Academy. 34-28, on November 20, then coming from behind on December 1 to beat Nottingham, 33-32. Henry Zamojski and Joe Szczech provided most of the points, though it was a free throw by Primo Ponti that provided the margin of victory over Nottingham. The Onondaga County League season got underway on December 4 with a 48-39 win over Split Rock. Zamojski led the way with 11 points, Felix Mozo and Harold Haight chipped in 10 apiece. A week later Solvay beat Camillus, 28-23, which was always satisfying. And before the Christmas break, on December 19, Solvay topped Marcellus High, 52-20, behind Joe Szczech's 22 points. and its Sunday edition, the Herald-American.